Analysis: Rose, Younghoe Koo and Caleb Sturgis all participated in the tryout, but the Bears are opting to stick with Christ Blewitt and Redford Jones as their kickers for now. Rose went 11-for-14 on field-goal attempts over 10 games between the Chargers and Redskins in 2017 but didn't see any NFL action last season. 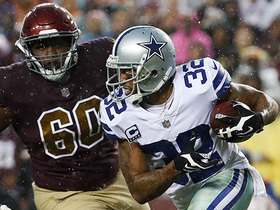 Analysis: Rose hasn't played in the NFL since 2017 when he spent two games with the Chargers and eight with the Redskins. Between the two organizations, he converted 11 of 14 field goals with a long of 55 yards. The Bears don't have an experienced kicker on their roster, but Rose will have competition in his tryout from fellow AAF alumnus Younghoe Koo. Rose was waived by the Chargers on Tuesday, Sam Fortier of The Athletic reports. Analysis: Rose's release by the Chargers comes less than a week after he was signed to help with kickoffs in the divisional round. He was on the field for three kickoffs and had no potential fantasy value while Michael Badgley was handling field goals. Rose will set his sights on making a roster in 2019 after failing to latch on with a team during the 2018 regular season. Rose signed with the Chargers on Thursday, Sam Fortier of The Athletic reports. Analysis: The Chargers are bringing back their kickoff specialist from 2017 in advance of Sunday's game against the Patriots, who have a dangerous return man in Cordarrelle Patterson. Rose kicked touchbacks on eight of his nine kickoffs in 2017, per Fortier. Rose was cut by the Texans on Friday, Aaron Wilson of the Houston Chronicle reports. Analysis: Rose struggled mightily during the preseason, missing kicks in each game he appeared in for the Texans. Having kicked for the Redskins and Chargers in 2017, the 24-year-old has made 11 of 14 field-goal attempts and five of six extra-point kicks in his NFL career. Rose will become an unrestricted free agent if he isn't claimed off waivers by another team. Rose went 2-for-2 on extra-point kicks and missed both of his field-goal attempts in Saturday's preseason loss to the Rams. Rose remains in Houston's camp while starting kicker Ka'imi Fairbairn continues to be sidelined by a soft-tissue injury, Aaron Wilson of the Houston Chronicle reports. Analysis: Rose filled in for Fairbairn during the team's second preseason game Saturday against the 49ers, when he connected on a 32-yard field goal but missed an extra-point kick. "I don't know where Fairbairn's at (with his recovery)," Texans coach Bill O'Brien said. "He's working hard to get back. He's a great guy, but we've got Rose in there now. Rose needs to make all of his kicks, just like everybody else needs to improve. Then, we'll see where Fairbairn's at." Rose auditioned for the Texans on Wednesday and signed a contract with them, Aaron Wilson of the Houston Chronicle reports. Analysis: This is expected to be a short-term roster addition. Starting placekicker Ka'imi Fairbairn is sidelined by a minor undisclosed injury that may cause him to miss Saturday's preseason game against the 49ers. Rose is a local product out of the University of Texas and kicked for Washington and the Los Angeles Chargers in 2017. He's made 11 of 14 field-goal attempts and five of six extra-point kicks. Rose was waived by the Jets on Monday, Rich Cimini of ESPN reports. Analysis: Rose was claimed off waivers by the Jets last month after finishing the 2017 season with the Chargers. The Texas product, who's converted 11 of 14 field-goal attempts and 23 of 26 PATs in 10 career games, will become an unrestricted free agent if he isn't claimed by another team off waivers. The Jets have claimed Rose off waivers from the Chargers, Ian Rapoport of NFL Network reports. Analysis: Cairo Santos is also on the Jets' roster, so Rose isn't guaranteed anything in his new context, but he will presumably compete to fill the team's place-kicking role, held last year by Chandler Catanzaro. Rose spent time with both Washington and Los Angeles in 2017, en route to converting 11 of 14 field-goal attempts and 23 of 26 extra-point tries. The Chargers waived Rose on Friday, Jack Wang of the Los Angeles Daily News reports. Analysis: Rose spent time with the Redskins and Chargers last season, converting 11 of 14 field-goal attempts and 23 of 26 extra-point tries. The Chargers signed Roberto Aguayo in January and Caleb Sturgis in March, likely setting up a kicking battle during training camp. 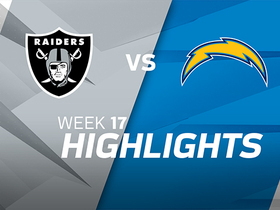 The Oakland Raiders faced off against the Los Angeles Chargers in Week 17 of the 2017 NFL season. 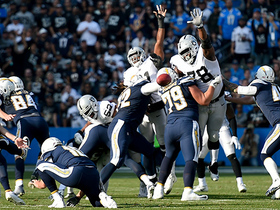 Oakland Raiders defensive tackle Denico Autry blocks Los Angeles Chargers kicker Nick Rose's PAT attempt. 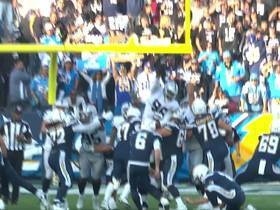 Oakland Raiders defensive tackle Justin Ellis blocks Los Angeles Chargers kicker Nick Rose's 50-yard field goal attempt. 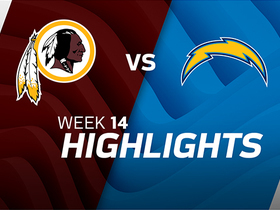 The Washington Redskins faced off against the Los Angeles Chargers in Week 14 of the 2017 NFL season. 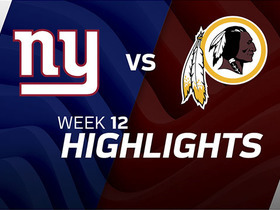 Watch as the New York Giants take on the Washington Redskins in Week 12. 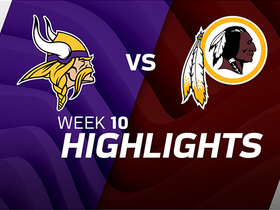 Minnesota Vikings quarterback Case Keenum throws for over 300 yards and four touchdowns to lead the way in a 38-30 victory over the Washington Redskins. 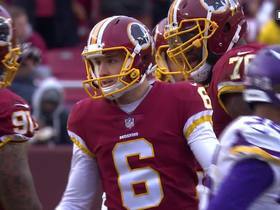 Washington Redskins kicker Nick Rose shows off his leg with a 56-yard field goal. 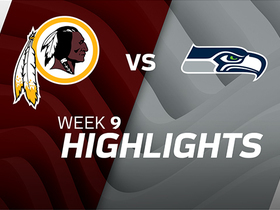 The Washington Redskins faced off against the Seattle Seahawks in Week 9 of the 2017 NFL season. 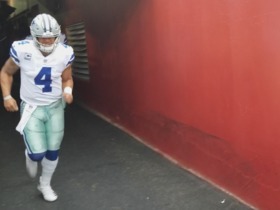 Dallas Cowboys quarterback Dak Prescott runs out of the tunnel in Washington to boos from hometown Redskins fans.